"Installation was quick - we didn't even have to be at home during the install. Highly recommend." "When he came out to do the work, he was professional and did an excellent job! I did not have to worry about cleanup or anything. He even hauled my old mailbox away. Excellent service"
"When he finished with the installation, you couldn't tell he had been there--no mess and best of all he took the old mailbox and post with him." Installation of our post and mailbox is $115. 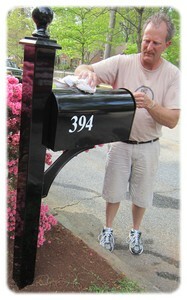 Installation of our post and customer supplied mailbox is $125. · extraction/disposal of existing post and concrete for new post. Prices also include notification of Georgia 811 call before you dig utility locators. You will never know we were even there! That's our Promise!